Ah, the Outback. A mysterious place full of Crabbits, Air Whales, and . . . Batman? Now that’s just bizarre. The Maxx is back! This time he’s asked to protect a new Outback, one he’s not familiar with. However, lucky for him he doesn’t have to do it alone. This time he has a partner. One with long pointy ears and a reputation for being antisocial. That’s right folks. 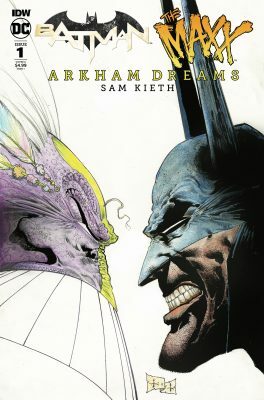 The Maxx and the Dark Knight are teaming up and the citizens of Gotham can kiss their sweet dreams goodbye. If you’re not familiar with The Maxx, here’s a little info to chew on. The Maxx was a bizarre comic and equally bizarre Cartoon series in the 90s, created by Sam Keith. 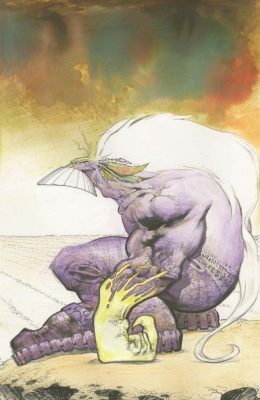 The series followed the adventures of the homeless hero The Maxx in both the real world and an alternate reality referred to as the Outback. I have not read the comics yet, but I have seen the series and it’s fantastic. I recommend checking them both out when you have the time, but for now, this book is a fun place to start. In Batman/The Maxx: Arkham Dreams, The Maxx is taken to Arkham Asylum where a suspicious doctor is experimenting on him. These experiments have to do with The Maxx’s connection to the Outback (a bizarre alternate reality). To make things more complicated, Batman has stuck his nose into things and soon finds himself in the Outback alongside his new purple buddy. Now it’s up to the two of them to help the purple queen and save the Outback from the unknown source that is poisoning it. Sound confusing? Well, it kind of is, but that’s how things go with The Maxx. He’s a truly bizarre character, and his story is definitely a weird one. Which makes him the perfect addition to the Gotham wall of weirdos. It is great fun to see the dimwitted, rambling, slightly crazy Maxx paired up with the intelligent, calculating, also slightly crazy Dark Knight. Keith uses Batman to bring an element of reality into the story. He’s the source of logic in the world of nonsense. However, Batman is still out of his element with this adventure, a point Sam Keith is sure to play to. Keith doesn’t seem even remotely grounded with this story. He is truly embracing the weirdness that has made his work so popular and interesting. Even if you’re not 100% sure where the story is going or what is happening, you can’t help but feel intrigued. The way he writes (and draws) seems to invoke a dreamlike quality that is surreal and almost entrancing. You can’t help but want more. Of course, the other draw of this book is Sam Kieth’s fantastically trippy art style. The world that is the Outback is a weird and mysterious place full of visual oddities, that are products of pure imagination. I know his style isn’t for everyone, but I definitely dig it. I also love the way he draws Batman. Gotta love them crazy long ears. His art also has a dreamlike quality that feeds off of the bizarre story, bringing it perfectly to life. 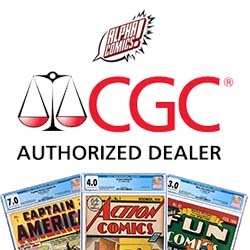 If you’re a fan of The Maxx or the other works of Sam Kieth (including Batman: Through The Looking Glass), then you are sure to like this book. It is very much a Sam Kieth book. Beautifully illustrated, and bizarrely told. It’s also a refreshing change for Batman fans. Seeing Batman in a new environment facing challenges that are quite foreign to him. These two characters make an odd team, but that’s ok because the Outback is an odd place.